Jake Guentzel was called up to play with the Pittsburgh Penguins November 2016. He had been in and out of the line up prior, making the five hour trek back and forth to Wilkes Barre whenever he was needed. When the calendar changed to 2017, it was safe to say that Guentzel wasn't going to have make that return trip again. He was here to stay. 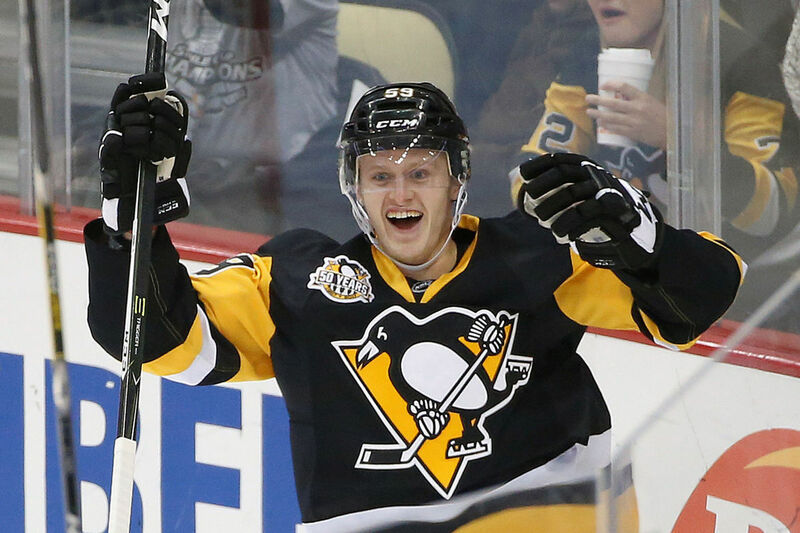 At the time of his call-up, Guentzel was making waves within the AHL, but no one could have anticipated the immediate impact he would have as a full member of the Pittsburgh Penguins. Since joining the team full-time, he has 13 goals and 30 points over 35 regular season games. Fast forward six months and not only has Guentzel established himself as the new hot-shot rookie, but he also has his name being tossed around as a candidate for the Conn Smythe trophy. Since its inception in 1965, the Conn Smythe trophy has been awarded annually to the Most Valuable Player in the NHL Playoffs as voted upon by the Professional Hockey Writers Association (PHWA). The PHWA was established in 1967 and consists of roughly 180 sports journalists that all carry a vote as to who should be given the honor of MVP. Recognizable names such as Pierre Lebrun (formerly of ESPN), Ken Campbell (The Hockey News), Bob McKenzie (TSN) and Greg Wyshynski (Yahoo! Sports), among many others, render a deciding vote. Who the most deserving of the award is determined on player performance throughout the playoffs, from first puck drop in round one through the last game of the Stanley Cup Final. Past recipients include both Sidney Crosby (2016) and Evgeni Malkin (2009), with the last American player to win the award being the Chicago Blackhawks' Patrick Kane (2013). It is for this reason that Jake Guentzel name could be tossed into the voting pool. 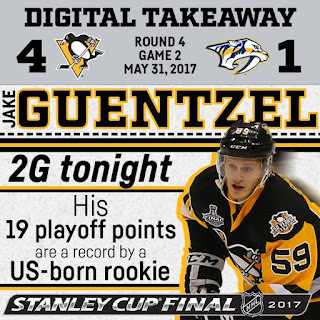 Since the start of the playoffs, Guentzel has been a history maker. He now leads in points among all active players in the current postseason with 19, making him the NHL all-time leader in playoff points among American-born rookies. His 12 goals put him second all-time among NHL rookies, two goals back from the current leader Dino Ciccarelli. Ciccerarelli amassed 14 goals in the 1980-81 playoffs playing with the (then) Minnesota North Stars. Guentzel could have a real shot at tying or breaking that record within the next few games. Does it give him a legitimate shot at taking home the trophy? It would seem so on paper, but all is not black and white. The last rookie to receive the Conn Smythe award was goalie Cam Ward with the Carolina Hurricanes in 2006. 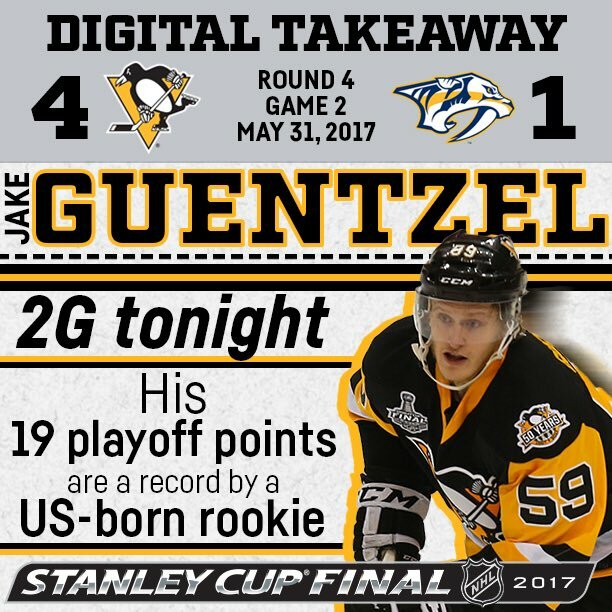 Should Guentzel win, he would be the first rookie in over 10 years to receive the honor. He would also be first rookie awardee to not be a goalie. Guentzel is also going to have to vie against some of the biggest names in the NHL. Evgeni Malkin is having just as good of a post season with nine goals, 17 assists for 26 points over 21 games played. Sidney Crosby can never be counted out of the vote. Add in a possible two-way split between goaltenders Matt Murray and Marc Andre-Fleury and it becomes clear how tight the race for MVP could be. One significant factor could keep Guentzel out of the picture all together: the majority of the PHWA come from the Canadian media and the obvious bias glares at you like an angry bull. All but seven Conn Smythe winners have hailed from Canada. Four of those seven are American, two are Swedes and only one is Russian. For those names and a full list of past recipients, click here. Though the odds may be stacked against him for this particular achievement, Jake Guentzel is tirelessly working towards the one that really matters - the Stanley Cup. Though being playoff MVP and getting his name in the record books is something special, it is also something that can't really be given much thought until everything is all said and done. "Sitting back on their laurels and saying 'wow, look what I did' is something these players have time for right now. They have to be focused on the next game," said Phil Bourque during the Penguin's Radio Post Game show after Game two on Wednesday May 28, and he is right. Keeping eyes on the main prize is the most important thing and one we all know is taken seriously. From his humble beginnings as stick boy for Phil Kessel to playing for the leagues top trophy at 22 years of age, the new kid in town definitely has a bright future ahead of him. Pens fans are just thankful that they get to watch it unfold.